Odeon Cinema on St. Albans Road. I was a babe born in 1938 in Watford, Mum and Dad raised me on the Kingswood Estate, Fernway, our garden had the North Watford Cemetery woods at the back. I went to Kingswood infants School and Miss Fowler and Miss Pooley were a couple of my teachers. Mr Burden was the Headmaster, Mr Truman was the school Caretaker, and lived in Briar Road his garden led into the school playground. 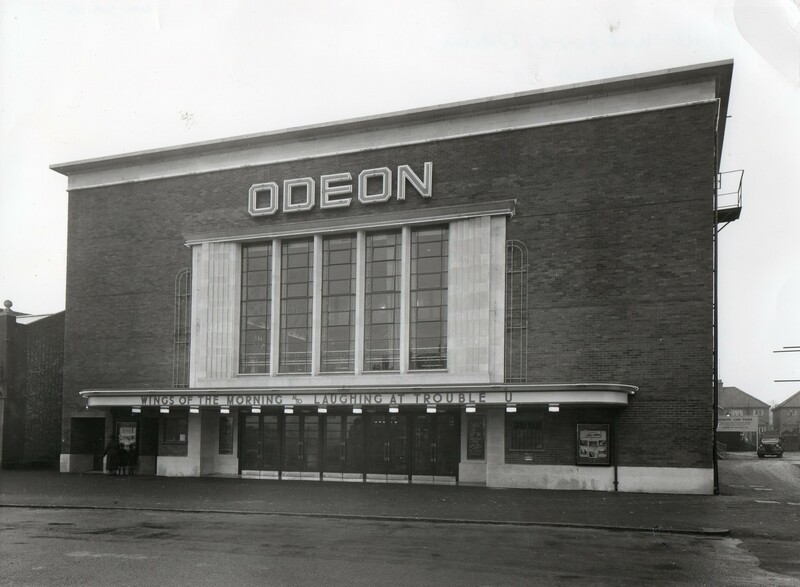 North Watford Odeon was our Saturday morning venture, I even remember the song we sang before the show. Bungalow stores for an ice lolly on the way home, then cowboys and indians up the spinney. I have so many memories, especially Flanagan’s Fair that came every year, the rag man that gave day old chicks for old clothes etc. Anyway if you remember me, I started work at Lilley and Skinners the shoe shop in the High Street, then just before I joined the Navy I worked over the road at Boots the Chemist, they actually had 15 featured windows, I had to dress them,and serve on counters. Then The Mocha bar became my haunt, especially The Chef corner , when I came home on leave, glass coffee cups and saucers filled from an Espresso Chrome plated machine (Mocha Bar). Great. Well folks I have only scratched the surface, as I may be so ancient that I have been forgotten. Oh yes, Leggatts Way Boys School, my teachers Mr Mitchel, Mr Casbon, Mr Ritchie, Mr Rolfe, and Mr Townsend. And as first years we got bumped and drowned under the tap in the playing fields. Must mention Cox’s sweet shop over the road from school, remember. The best times was the Girls sports days, you guessed it our noses were firmly pressed up on the windows of Mr Day’s Science room. Watford, the best town ever. Brings back many memories lived first of all in Salisbury Road and went to Parkgate Junior School ,remember trekking from the school to our playing fields for football the other side of the dome roundabout ! Then to Leggatts in 1956 until 1961 when John Townsend was my form master , nice guy and he managed to coach me to pass my GCE in O level which surprised.both of us ! When I was 14 we moved to Orbital Crescent just off North Approach built where the circuses and fairs used to set up , what an innocent world it was in those days . Still support the Hornets ! what memories was born 1945 in flat above Pearsons the green grocers next to the North Watford Odeon Went to Parkgate Junior school then to Leggatts Way now living in Bovingdon but still have season ticket for Watford. I too went to Leggatts Way School 1947-49, remember Mr Casbon. Navy from Watford in 1951, then Canada in 1956. 81 yrs old now so memory not so sharp. I remember Eddy Edmunds, Peter Cook, Ken Fryer, Terry Cooper, and Tony Coffey, It was Mrs Flo Coffey that played the Organ at the Odeon on Saturdays. mr Casbon was our music teacher, remember Mr Townsend helped me a lot at cricket and went on to play good standard he used to call me the chinaman, good days. Reading about Tony Atkins memories was like hearing my Wife Joy Hall (Nee Tanswell) reminisce with her Sister. My wife, then Joy Tanswell, was born in Perivale Gardens May 1938. The house was purchased new by her Father Brian Tanswell who ran an electrical business called ‘T & S Electrical Services’. Joy also attended the same schools, and enjoyed similar activities. The Austin Family lived opposite. We still live in Perivale Gardens, having purchased the house, after her Fathers death. I will explain how I came to read Tony’s comments, after I have completed my comment. She will be surprised that there is somebody who experienced similar past times on the Kingswood Estate, and will be desperate to read Tony’s comments for herself. I will now close, it will be interesting to see her reaction.